Looking comfortable in his new streamlined Maple Leafs sweater with the 'C' stitched on the shoulder, Dion Phaneuf told the media and roughly 100 season ticket holders at Real Sports Bar & Grill that his plan is to stay true to himself and what got him to this point in his career at only 25 years old. Phaneuf has been a Maple Leaf for less than five months and already you can find his name on a list with Toronto greats such as Mats Sundin, Doug Gilmour, Wendel Clark, Darryl Sittler, Dave Keon and George Armstrong, because on Monday he was officially introduced as the 18th captain in franchise history. In addition to naming Dion Phaneuf as the team's captain, the Maple Leafs also unveiled a modified sweater that includes two horizontal white stripes around the waist and what they call the "classic style" veined Leaf logo on the sweater patch. A string lace collar on their home and road sweaters replaces the V-shaped collar. The lettering and numbers are single layered without an outside trim. The two stripes on the arm and the 11-point Maple Leafs' front crest remain unchanged. "Our fans have been quite vocal since 2007. They have wanted the stripes and shoulder patch back on the sweater," Tom Anselmi, executive vice-president and chief operating officer for Maple Leaf Sports & Entertainment, said in a statement. "We listened to them, and we hope they are as excited about the new, classic look as we are." Clark, Sittler and Armstrong sat on the same dais as Phaneuf on Monday and Leafs coach Ron Wilson introduced the Leafs' new captain, the team's first since Mats Sundin departed Toronto in 2008 after 13 seasons with the franchise and a decade spent as captain. Wilson said it wasn't until GM and President Brian Burke pulled off the blockbuster trade on Jan. 31 that brought Phaneuf to Toronto that he thought the team had someone worthy of being the captain. "It's been a process obviously since the day I got here," Wilson said. "When it became apparent that (Sundin) wasn't coming back we hesitated, and more than anybody I hesitated in naming a captain until I got to know the team somewhat. "Over the timeframe of almost two years we felt that we didn't have anybody that could match up historically with previous captains. To my right are three of the greatest captains in Maple Leaf history (Armstrong, Sittler, Clark). We have basically a wall of history in our dressing room right now where all the greatest leaders in Maple Leaf history are commemorated. Lots of great pictures. We felt that we didn't have a player until the last couple of months of last season who would be able to be worthy of being a captain of the Toronto Maple Leafs." Burke also talked about the Leafs' history and finding who they believe is the right guy to be captain -- not just any guy. "This is not just another NHL team; this is the Toronto Maple Leafs," Burke said. "This is one of the greatest brand names in all of sports. We wanted to make sure today that we put the 'C' on someone that will live up to that." Burke called the decision to name Phaneuf captain Wilson's alone, but "if I had been asked, this is the player I would have Ronny to name as the team's next captain." Wilson's choice isn't all that surprising considering Phaneuf served as an alternate captain for the last two and a half months of the season after arriving in Toronto from Calgary. He learned what being a captain is all about from Jarome Iginla for four-and-a-half seasons. "Dion represents everything we want a Toronto Maple Leafs player to be -- someone who plays with passion, who comes to the rink each day and works harder than anybody, shows up on the ice and is difficult to play against in addition to being a great hockey player," Wilson said. "I had the pleasure of coaching against Dion when I was with San Jose and we thought right off the bat he was a remarkable talent and getting better every year. The fact that Brian was able to make this remarkable trade and land Dion on our team is only going to give us great benefits for this franchise for years to come." Phaneuf, who pulled the new-look Leafs' sweater over his white dress shirt, called it a "tremendous honor" to be named captain of the Leafs. After issuing several thank yous, starting with the fans that came out to the new restaurant in Maple Leaf Square, across from Air Canada Centre, Phaneuf explained what kind of captain he is going to be. "With this new responsibility, my plan is to be myself. I want to lead on and off the ice. Above all else, the team and winning hockey games will be front and center." "With this new responsibility, my plan is to be myself," he said. "I want to lead on and off the ice. Above all else, the team and winning hockey games will be front and center. We have a lot of work to do, but we'll work hard together. Everyone is ready to learn and get better as a team. I'm confident and welcome my role in seeing that happen. We have a good team and have a lot to be excited about." 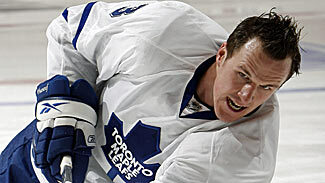 Phaneuf added that he is "looking forward to working with each and every (member of the media)." Toronto's media corps is among the largest in the NHL, something former captains such as Sittler and Clark know all about. "Wearing the 'C' (makes you) the center of attention when things are going bad as well as when things are going well," Clark said. "The big thing is you just be yourself and be true to yourself. We're all pretty simple people that love playing the game of hockey. Everybody looks up to the player that has the 'C' and for that reason you don't change. When questions are asked you just answer the question right back, the best you know." Added Sittler: "Dion has a young group of guys that are working together to build the future of the Toronto Maple Leafs and it's important that those guys support you. I know we'll be here to help you as well." They were there on Monday during what was a gala affair to mark what Burke called a historical day for the Maple Leafs. Armstrong, the last Maple Leafs captain to lift the Stanley Cup (1967), commented on how different it was when he was named captain. "We went in to play our first game, looked at the sweater and the 'C' was on my sweater. That was it," Armstrong said, laughing. "The only advice I would have for Dion is to be what he has been in the past. He's a leader. Just don't let it get to your head."